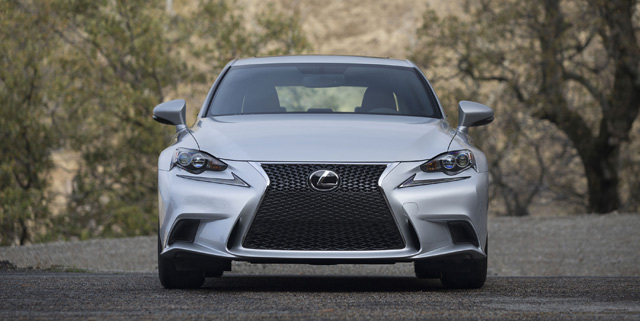 After two days of live coverage at the Detroit Auto Show, it’s time to work through all of the information released about the new 2014 Lexus IS. The best place to start is with the official press release — here’s the full text, along with a selection of new photos. 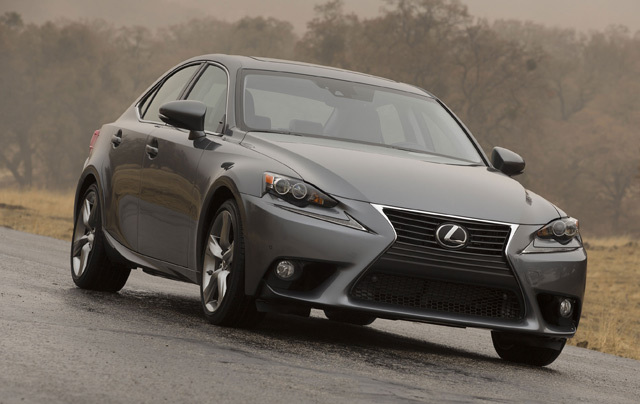 Lexus today unveiled the all-new 2014 IS sedan at the North American International Auto Show. 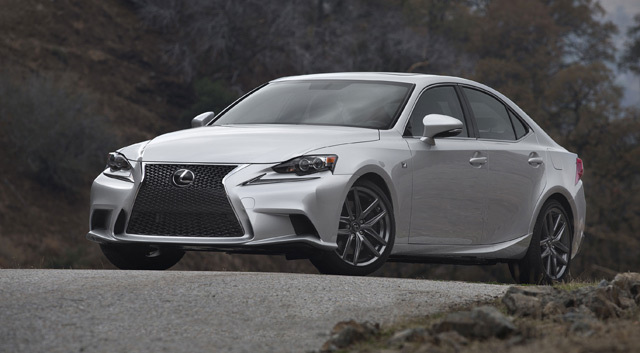 IS will be available in rear- and all-weather drive versions of the IS 250 and IS 350, a further evolution of F SPORT available across the entire model range, and for Europe, Japan, and select international markets, the IS 300h, the first IS to feature Lexus Hybrid Drive. 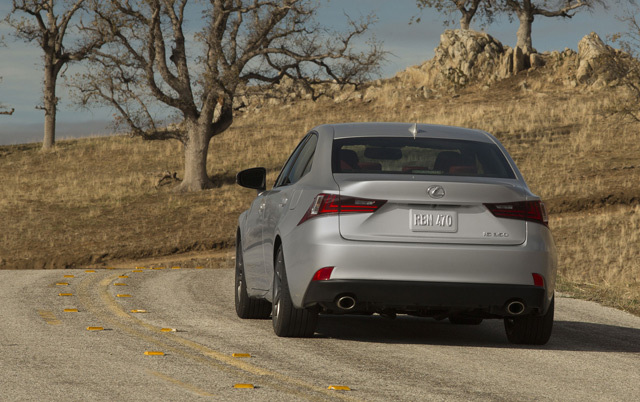 Rear- and all-weather drive versions of the IS 250 are powered by a 2.5 liter V6 gas engine. 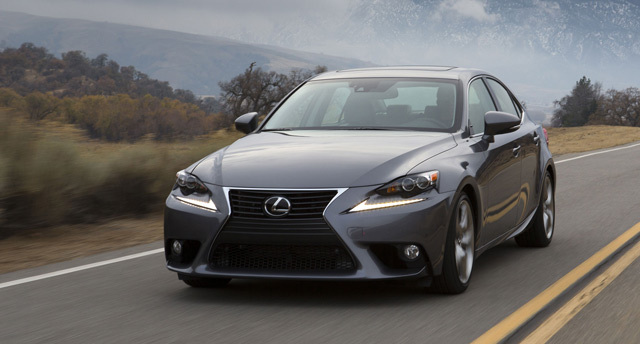 The IS 350 features a 3.5 liter V6 gas engine. The IS 300h, which will be available in Europe, Japan, and select international markets, will employ the Lexus Hybrid Drive powertrain, based on a newly developed 2.5L Atkinson-cycle engine. IS adopts the Drive Mode Select system which offers up to four switchable driving modes- ECO, NORMAL, SPORT and SPORT S+ (S+ available on IS 350 only) – to optimize vehicle systems to suit the driver’s preferred combination of fuel economy, comfort, performance and handling characteristics. The IS 350 RWD features the eight-speed, Sport Direct Shift (SPDS) automatic transmission from the IS F high performance sedan with quicker shifts, full torque converter lockup and throttle blips in manual mode. The new IS is the first Lexus model to adopt G force Artificial Intelligence (G-AI) control in Sport mode. This system automatically selects the optimal gear and downshift pattern in response to G force, and maintains the selected gear through a corner. Driving enjoyment was at the heart of the new IS development program, and every aspect of the new Lexus sedan’s driving dynamics has been carefully engineered to that end. New, laser screw welding and adhesive body bonding techniques, along with additional spot welding, have increased overall body rigidity. This enhances stability and also allows for a more comfortable ride without compromising handling agility. The double wishbone front suspension system has been revised, offering a twenty percent increase in sway rigidity. The rear adopts a new multi-link suspension system from the GS. Fine tuning has resulted in outstanding grip performance and excellent response to steering inputs. 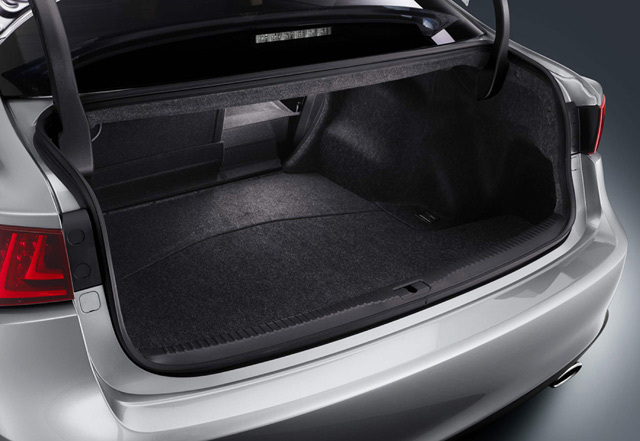 Separate mounting of the spring and shock absorber maximizes trunk space. Steering feel and feedback is key to an enjoyable driving experience, and the new IS benefits from a steering gear box based on that of the GS sedan, incorporating a variety of tuning techniques. The structure and rigidity of each gear box component has been revised to create a smoother and more accurate steering feel with enhanced input response and greater driver feedback. On board, drivers will receive vehicle information from an innovative driver’s meter cluster with a moving center ring, inspired by the LFA. 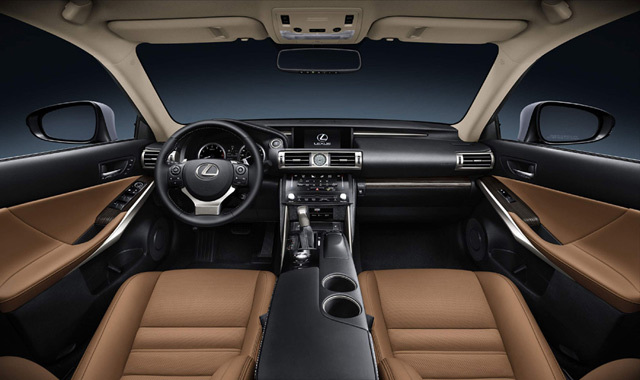 Interior trim detailing includes an F SPORT steering wheel and shift knob, and aluminum pedals and scuff plates that include the Lexus logo. The overall dynamic shape of the body emphasizes the wide flare of the wheel arches to give the new IS a broad, powerful stance. 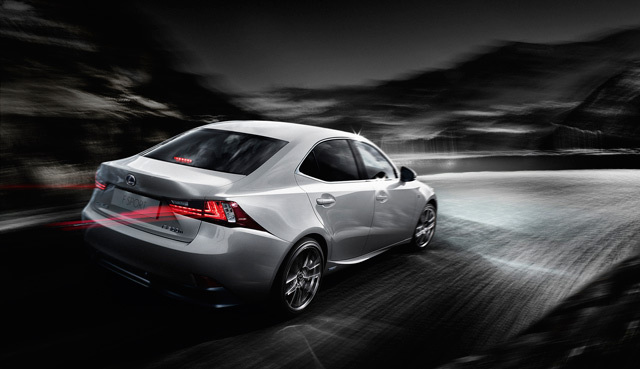 In profile, the strong horizontal beltline shows off the large rear tires and its low center of gravity. The exterior design includes a new, powerfully articulated headlamp cluster design with Lexus’ trademark, L-shaped Daytime Running Lights (DRL) located independently below. The clean, horizontal theme of the interior is bisected by the strong upward sweep of the center console, creating an ergonomically ideal environment. The newly designed driver’s seat offers greater comfort and better lateral support. Both the seat hip point and the angle of the new, LFA-inspired steering wheel have been lowered and steering reach adjustment has been increased, creating a driver focused seating position. To better accommodate passengers, the new IS wheelbase is nearly three inches longer, providing a more comfortable cabin and increased trunk capacity. The extended wheelbase and a thinner front seat design results in three inches more knee room for rear passengers. New to the IS are standard, lockable 60:40 split/folding rear seats. Refined materials throughout the cabin are complemented by a high quality analog clock with surface-emitting illumination. 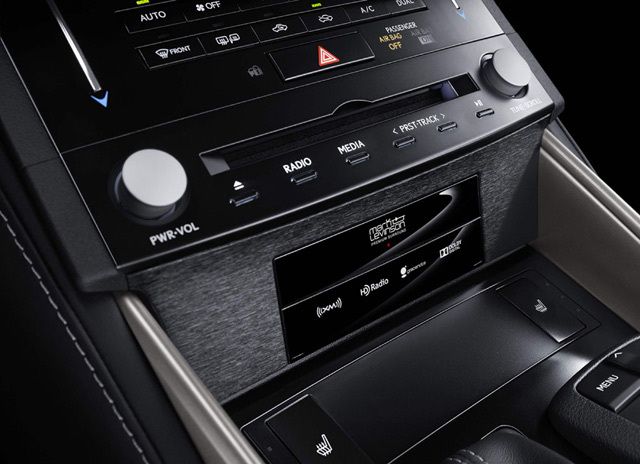 The climate control system incorporates Lexus-first electrostatic switches, which enable vehicle occupants to adjust temperature settings with the touch of a finger. All IS models are equipped with the next generation, Lexus Display Audio or Remote Touch-controlled Navigation multimedia systems. Both multimedia systems provide industry-first complimentary real-time traffic and weather information delivered without a subscription through HD™ Radio Technology. The new steering wheel is the first on a Lexus to coordinate multimedia system control with both the meter cluster and center console displays. 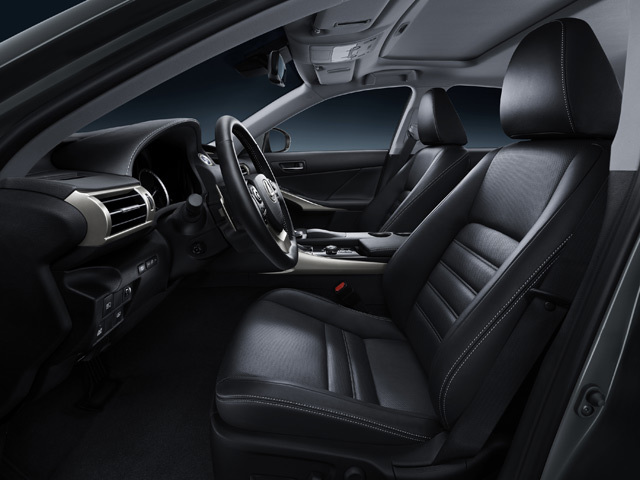 The 2014 IS has 10 airbags standard, including rear seat side airbags. Available safety and security features include an Automatic High Beam (AHB) headlamp system, a Lane Departure Alert (LDA) system, a Blind Spot Monitor (BSM) and a Rear Cross Traffic Alert (RCTA) system. The AHB headlamp system maximizes visibility at night by automatically switching to low beams when its camera detects the lights of either an oncoming or preceding vehicle. An LDA system helps prevent unintended lane changes by alerting the driver when the vehicle deviates from its lane without the operation of the turn signal. The BSM uses rear mounted radar to detect vehicles in adjacent lanes that are not visible in the outer door mirrors. The RCTA system employs the BSM radar to alert the driver to approaching vehicles when backing out of a parking space.